When I went into my account to start this blog, I found that the last post I started was over a month ago. 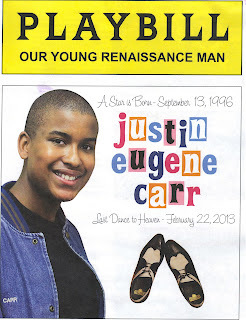 It was the day after Justin Carr's life tragically ended, and I was grasping at all forms of normalcy to try and deal. As I sat at the computer that day, everything just started to spill out. All the details of the twenty minutes from when I was joking with Justin until he was whisked away in an ambulance. As my wife sat with me making sure I didn't have a complete breakdown, she cautioned me that maybe I should give it some time. Perhaps reliving it wasn't what I needed in that moment. She was right.... as usual. What I needed, and have needed in the weeks since, was my family and friends to keep touching base because when my mind was left to idle, my mental DVR would start replaying the afternoon of February 22nd between 3:40p to 9:30p. I'd see Justin's face, and that of his parents when I greeted them at the hospital. I'd see the faces of shock that his teammates and classmates wore as they sat in the hospital grieving. I'd hear my boss deliver the news that he didn't make it. The only things that seemed to stop the playback and allow me to keep moving were the texts, emails, and words of encouragment I received from my colleagues, family, and friends. The laughter and innocence of my boys was invaluable as was the reassurement from those who had been through similar situations that it was okay, in fact necessary to keep living. Needless to say, forming opinions about politics, sports, and entertainment were the last things on my mind. Slowly, I have been able to get back to a sense of normalcy, and that has mainly been due to the recognition that I have to play my part in keeping Justin's legacy alive. He packed so much activity into a sixteen year life. From the way I coach to the way I raise my boys, everything will be infused with the memory of what Justin was striving to do in his life, and the impact he had on those he touched. He figured out how to be comfortable in his own skin given that his interests didn't fit the "profile" for a young black man. That's a powerful lesson for any family. He also pursued his interests relentlessly, which I will continue to carry with me. I've found that focusing on these lessons keeps the DVR playback at bay. The images like the one pictured and the video below help my brain focus on something else, and I will continue to need that for the foreseeable future.